Disclosure: I was not financially compensated for this post. I received a sample of the product for review purposes. The opinions are my own, based on my experience with the product. 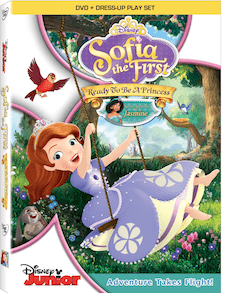 On September 17th, 2013, select episodes of Disney Junior’s hit show Sofia the First arrive on a new DVD called Ready to be a Princess. Almost every little girl dreams of what it would like to be a princess—and for one little girl, that dream has come true. Join Sofia as she learns the ropes of what it takes to be a real princess, making new friends and learning life lessons along the way. It seems like everywhere I go I see tons of books and dolls from the Disney Junior show, but up until now I’d not seen a single episode. The Ready to be a Princess DVD contains five episodes from the show: “A Royal Mess,” “The Shy Princess,” “Blue Ribbon Bunny,” “The Princess Test,” and “Two to Tangu.” These are five episodes from the first season of the show, and although I hadn’t seen the four episodes that aired before these, I did not feel lost in the storyline. Each episode of Sofia the First had a theme; for example, in “A Royal Mess” Sofia, James, and Amber learn that they should always tell the truth and that lying even with good intentions still has consequences. Small children lie quite easily (I know I’ve experienced that with my five-year-old), so this is a great episode to watch together as a family and then discuss what is learned. In “The Shy Princess,” Sofia befriends Vivian, a princess that is different than the other girls. Sofia helps the other princesses and Vivian find common ground. Even in early grades in schools, children already begin to distance themselves from other kids. Watching this particular episode can encourage kids to reach out to other children that might be very different from themselves. In “Blue Ribbon Bunny,” Sofia unintentionally hurts her best friend Clover’s feelings and ultimately learns his friendship means more to her than winning a contest. 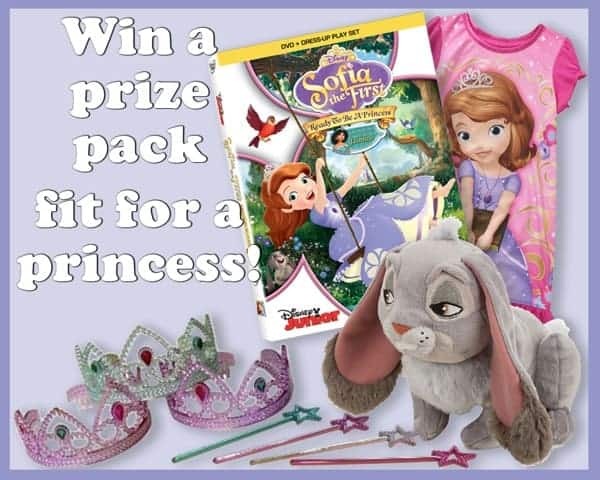 In “The Princess Test,” Sofia puts another’s needs before her own. In “Two to Tangu,” Amber learns how to face her fears and try new things. Princess Jasmine even makes an appearance to help Sofia and Amber find their friends! I loved the positive message that each of these episodes brings to small children. Right now, those messages might now mean much to my daughter; she is more focused on the pretty dress Sofia wears and Vivian’s energetic dragon pet, Crackle. As we watch the episodes over and over, I hope she’ll begin to pick up on the interactions between the characters so we can discuss them together and apply them as needed in her own life. Sofia the First is a wholesome, family-friendly show with strong moral lessons, creative storylines, unforgettable characters, and Broadway-style music that you’ll want to sing along with. I wouldn’t hesitate to purchase the earlier episodes in the series for my daughter—to be perfectly honest, I’d watch them on my own, too! This DVD also contains an adorable paper doll with six stick-on dresses! My daughter loves her Sophia paper doll; it’s never far from her side. My grandaughter loves Sophia and the nightie would fit her perfectly! My grand daughter will love this GIFT Pack. I love that it is so family orientated! Would love to win this prize,good luck to all. WOW..YEP..LOVE,Sophia trying to for my little cousin..
WOW..YEP..LOVE,Sofia.. trying to for my little cousin.. This would be adorable on my niece! I would love to give this gift to my little niece, Natalya! My daughter would love this, She watches Sofia the 1st everyday. This is great giveaway! My granddaughter LOVES all the princesses. Thanks for the chance. My son actually really likes Sophia and would love this! haven’t been to the site for a while. I love the new logo!